Everybody's favourite emo deity The Outsider features in this new trailer for Dishonored 2, as do a few other characters from the original game. It's described as a 'Corvo Gameplay Trailer', but there are more than a few plot titbits tucked away inside, including a wee bit more on the game's apparent villain. Brigmore Witch Delilah appears to have been upgraded to a fully fledged villain for this sequel, and as we can see in the above video, our newly voiced protagonist Corvo rather has it in for her. The Q-like figure of The Outsider also makes a return, and I'm very pleased to report that he hasn't learned how to speak in a non-mysterious manner in the intervening years. 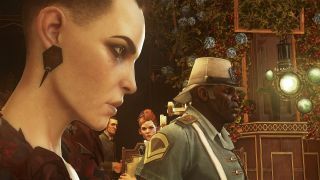 Dishonored 2 releases on November 11, and to make the wait a little more bearable, why not read our interview with director Harvey Smith? Or watch Emily Kaldwin kill everyone in the previous trailer.